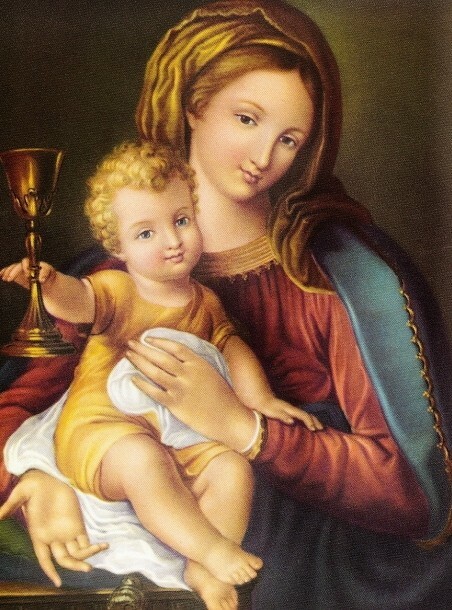 This is our second motto, as it were, after “Pro Christo In Sacerdote Suo” or “For Christ In His Priest.” Essentially that is because we can never be for Christ in His Priest without first being like Mary, Mother of Priests was, as she showed us during her earthly life. Now, in Heaven, she continues to assist us in the lifelong task to conform ourselves to the Crucified. Our Marian devotion cannot be limited to devotionals. If imitation is the highest form of flattery, then we constantly strive to imitate the first Handmaid of Our Lord, the Blessed Mother, in her “Fiat” to God’s Will. That “Fiat” is as glorious as it is painful because in living it we give the Heavenly Father a blank check to do with us as he wills. But that obedience to his will is precisely what gets us closest to Jesus. When we find it difficult to follow Jesus, we can always follow Mary. She will always lead us to her Son. Mary is the first Handmaid of the Lord who, though she had the greatest right to be near Jesus every day of his life in her role as mother, chose to embrace the will of the Father by being obedient to Jesus’ wish that she instead be his best disciple. For her this was largely a hidden role, in the background praying until that intense crescendo of union of their wills on Calvary. Mary accepted, in her humility, to remain obscure and on the periphery of Christ’s day to day ministry, despite her importance in the life of her Son. As we explain in our page about papal enclosure, our willed separation from the world frees us to pray and sacrifice for everyone in it, far beyond anything we could accomplish physically in a direct apostolate. It is the Mother of God, Mother of Priests, who shows us how to live this way. She did it first as Jesus embarked on his earthly ministry; then, as a source of strength, as the Church gathered about her after the Resurrection awaiting Pentecost. But now she reaches all souls in need of her help from Heaven. It is her perfect union with her Son that enables her to assist everyone. We are not hiding away from anyone. We are hidden in humility like Mary was on earth while we plead for her Heavenly intercession for her priests. We do this especially for priests in spiritual need but exclude no one from our prayers. As she did in Cana, so now she brings pleas for others before her Son. So we bring souls before our Lord for his healing and help in their lives that only God can truly provide. We go straight to Christ in the Blessed Sacrament, we go straight to the source of the solution to every problem presented to us in prayer requests. What is perhaps most striking about the most perfect woman, immaculately conceived, that ever walked the face of the earth is her complete submission to the plan that God the Father had for her life. How often she pondered the mystery of Jesus’ mission and hers in her heart. How little she speaks in the Gospels. Her last recorded words tell us much, “Do whatever he tells you.” Though Immaculate she did not climb on a pedestal for others to admire her sinlessness. She climbed Calvary instead. Despite the inscrutability of his will in asking her to consent to become his Mother, she humbly submitted and unwaveringly grew in faith even as it became clearer that he would ask the ultimate sacrifice of her. As Jesus moved closer to the cross, she freely allowed him to do so, embracing the pain and transforming it into a bountifully fruitful gift to all the world. When Christ as he was dying gave his Mother to John, and John to her, he was giving us the perfect Mother to show us how to unite ourselves to Christ on the cross…obediently, silently, accepting suffering in quiet surrender, confident that this is how God wishes us to aid priests and the entire world. Mary, Queen of the Clergy and Mother of Priests, Pray For Us!